OK—I was bored with the usual and when I encountered a beef tongue decently priced at Atkinsons’ Valley Market, I bought it with gusto. 20 degrees outside is perfect for an interior made tongue dish. As I was cutting away the skin, I had warm memories of my mother serving my first introductory tongue at the table—skin on-in full glory and I was only 5 or 6. Oh my—I couldn’t believe it however when my mother was done peeling off the skin and serving it, I thought differently. It was delicious and still is—but the memories are strong and I had a good laugh today as I was pealing the skin—in memory of my dear mother. (Hint: You really are supposed to peal the skin pre-serving it.) Oh well, leave it to the Dutch. In a large deep pot, place ingredients # 1-7 mentioned above in the pot and barely cover all with water. Bring to a boil; reduce heat to a rolling simmer; cover and cook for about 3 hours. Do watch to make sure you aren’t simmering to much or that the water level is still adequate. 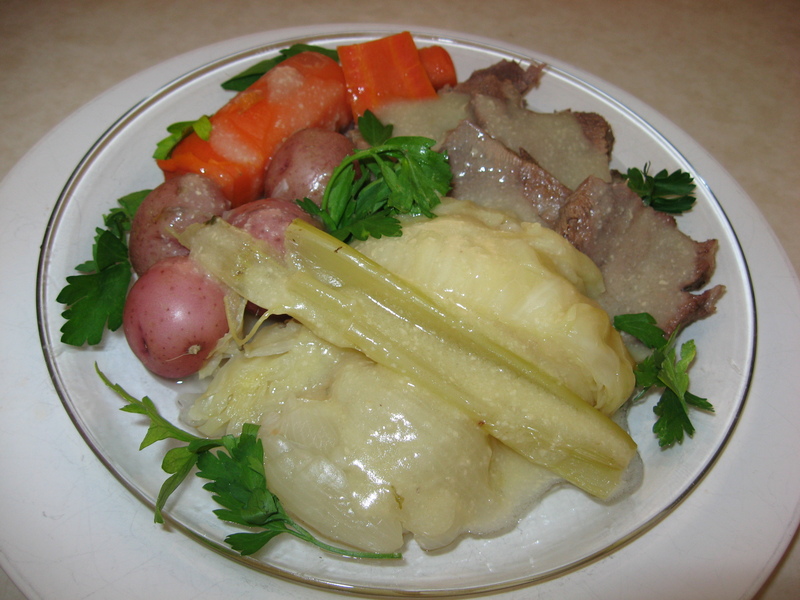 At the 3 hour point, remove the tongue (it should be fork tender at this point) and add to the pot the cabbage, small red potatoes and 2nd carrot. Peel the tongue and remove the roots. Place the prepared tongue back in the pot on top of everything. Simmer fairly briskly covered for another 1/2 hour or until the potatoes, 2nd carrot and the cabbage are done. When they are done, turn off the heat. Now is the time to make the mustard sauce. 1 C. of the tongue broth. In a pan, over medium heat, melt the butter and stir in the flour till totally dissolved. Add the prepared mustard and slowly add in the tongue broth. Bring to a gentle boil and take off heat. If there are still lumps in your sauce, strain it. Serve in a gravy bowl for guests to pour for themselves or pre-plate for guests with the sauce over all. 5. Make sure to add more roughly chopped flat leaf Italian parsley to your servings.